Huawei's FusionCube for HANA has 512GB of RAM. 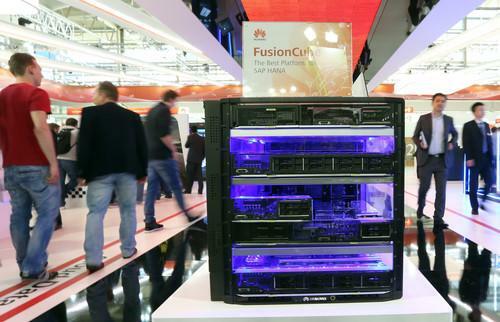 Huawei's enterprise unit has launched the FusionCube for high-end HANA systems and will also work with SAP on products for areas such as enterprise mobility. The enterprise segment of the IT market isn't an easy one to break, but with its 3-year-old unit Huawei is betting big on repeating the success the company has seen in most parts of the world with its telecom infrastructure products. An important part of this push is working with SAP on offering hardware for enterprises that want to run their own HANA (High-Performance Analytic Appliance) installations. The HANA platform stores information to be processed in-memory, instead of moving it on and off of disks, which speeds up performance. For the second year in a row, Huawei has announced new HANA hardware at the Cebit trade show in Hanover, Germany. Last year, the company announced that SAP had certified one of its servers for use as a single node appliance. On Tuesday, it announced the FusionCube for HANA, which offers more power and better scalability. The basic configuration of the FusionCube has four Intel Xeon E7-4870 processors running at 2.4 GHz and 512GB or RAM. Users can then choose how much SSD storage they want to add on top of that. For enterprises or other organizations that want maximum performance, up to 16 nodes can be used as one system. The underlying operating system is Suse Linux Enterprise Server 11 for SAP, which has been certified for running applications from the German software company. It offers a simplified and automated installation process that requires fewer SAP and Linux skills to set up a working system, and reduces the time and errors associated with a manual installation, according to Suse. In addition to HANA, it has been customized for applications such as NetWeaver Enterprise Search, NetWeaver Business Warehouse Accelerator, and BusinessObjects Explorer, Suse said. Huawei didn't elaborate on what the FusionCube will cost. However, the ability to manage servers along with storage and networking using the same tool helps lower costs, according to the company. Using the integrated storage also cuts costs and simplifies installation, it said. Beyond HANA, the two companies are also working enterprise mobility systems for companies whose employees are allowed to bring their own devices to work. In this segment, Huawei will work with SAP to develop what the company calls "mobility-in-a-box" solutions for the enterprise mobility market. It envisions a cost effective and secure platform that can be accessed from anywhere on Huawei devices and that integrate with applications from SAP. Making a name for itself in the enterprise segment outside of its Chinese home market won't be an easy task for Huawei, but the company is making progress. In the Asia Pacific region its server market share was 12.1 percent during the fourth quarter of last year, compared to 5.4 percent during the same period in 2012, according to estimates from Gartner. In the Europe, Middle Easy and Africa region, the company's share grew from nothing to 1.1 percent, Gartner said. One of the reasons SAP and Huawei are such a good match is that they have very complimentary product portfolio, according to Alex Atzberger, chief of staff, office of the CEO at SAP. "There is very little overlap between the two companies," he said.